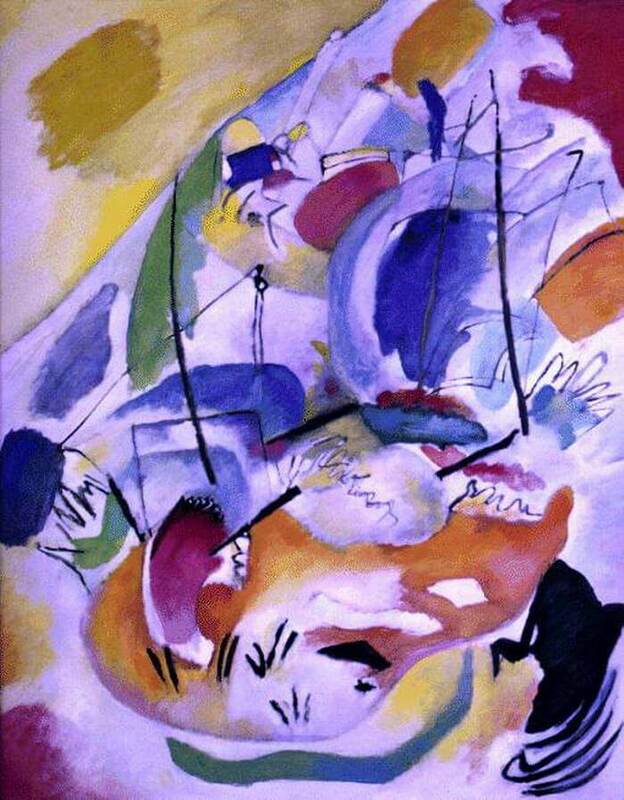 In his seminal 1912 publication Concerning the Spiritual in Art, Wasily Kandinsky advocated an art that could move beyond imitation of the physical world, inspiring, as he put it, "vibrations in the soul." Pioneering abstraction as the richest, most musical form of artistic expression, Kandinsky believed that the physical properties of artworks could stir emotions, and he produced a revolutionary group of increasingly abstract canvases - with titles such as Fugue, Impression, and Improvisation - hoping to bring painting closer to music making. Kandinsky, a determined and sensitive man, was a good prophet to receive this vision. He preached it by word and by example, and even those who were suspicious of this new freedom were frequently convinced by his paintings. Improvisation 31 has a less generalized title, Sea Battle, and by taking this hint we can indeed see how he has used the image of two tall ships shooting cannonballs at each other, and abstracted these specifics down into the glorious commotion of the picture. Though it does not show a sea battle, it makes us experience one, with its confusion, courage, excitement, and furious motion. Kandinsky says all this mainly with the color, which bounces and balloons over the center of the picture, roughly curtailed at the upper corners, and ominously smudged at the bottom right. There are also smears, whether of paint or of blood. The action is held tightly within two strong ascending diagonals, creating a central triangle that rises ever higher. This rising accent gives a heroic feel to the violence.